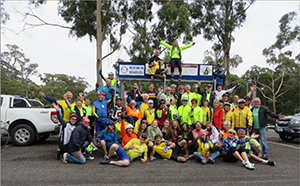 The Southern Star Group is proud to have supported the 30th Annual Ride for Research by Australian Rotary Health. The 650 kilometre bicycle ride saw keen cyclists travel from Mansfield to Shepparton through challenging country conditions over 5 days. Since 1986, people have participated in the annual ride in order to aid the Rotary Club in funding meaningful projects that help many people who are suffering. Riders are sponsored to complete the ride with all funds raised donated to Australian Rotary Health. The 30th ride coincided with the outstanding milestone of raising one million dollars for research over the past 30 years. Major projects funded by Australian Rotary Health include mental health research, adolescent health and family health. The Ride for Research is an innovative way to generate awareness and raise much needed funds for these issues, while promoting health and providing a fun activity. Well done to all involved including the riders and organisers on this fantastic achievement!